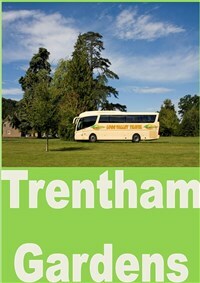 A popular visit last year, Join us as we visit the award winning Trentham Estate. Our visit to Trentham Gardens was enjoyed by our clients last time so we have decided to repeat it for this year, as its a perfect destination for all ages and interests. Whether you would like to stroll through the award wining Gardens, a ramble around the lake or a wander through its woodland. There is also an attractive shopping village and a large garden centre to explore. The award winning gardens are where you can explore its breath taking vistas, stroll around the mile long lake, search for fairies or take a ride on its miniature railway train. You can also relax in the Italian garden tea room and enjoy the panoramic views. The shopping village is the perfect choice for a spot of retail therapy as it comprises sixty individual shops, restaurants and cafes housed in charming timber lodges. Important Notice: We do not include entrance to the Monkey Forest, this will be an extra cost payable on the day to Trentham Gardens. We join our coach from your local joining points and travel through Shropshire to the county of Staffordshire and Trentham Gardens. After a day of exploring we rejoin our coach for the journey back to your joining points. Time to explore Trentham Gardens and the attractions such as its shopping village. Please note we do not include entrance to the monkey forest.